Yarn shown in this swatch: Katia Panama. Needles: US 2 - 2.75mm. Purl 2 sts together: P2tog. Cable 4 front: C4F - Slip next 2 sts onto a cable needle and hold at front of work, knit 2 sts from left-hand needle, then knit 2 sts from cable needle. 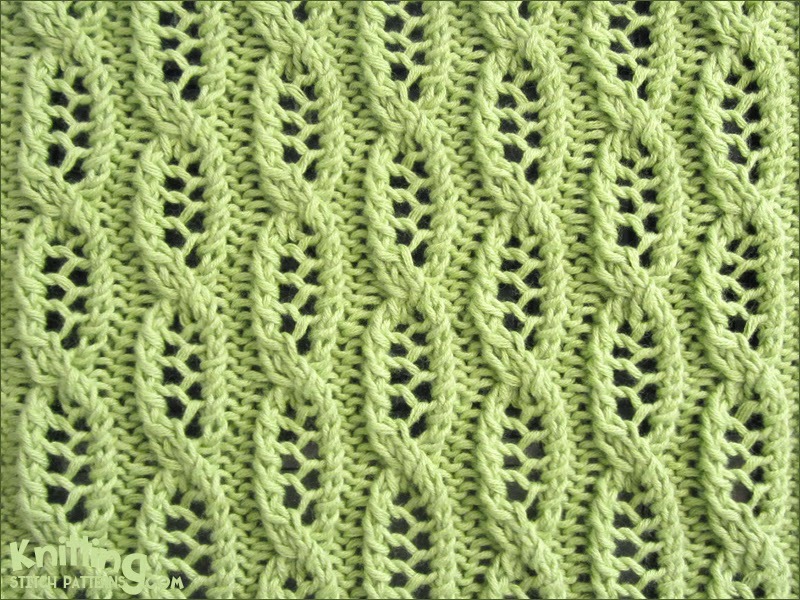 Knitted in a multiple of 12 sts +8 and a 12-row repeat. Row 1 - Right side: P2, * k2, yo, ssk, p2; repeat from * to end. Row 2 and all wrong side rows: K2, * p2, yo, p2tog, k2; repeat from * to end. Row 3: P2, * k2, yo, ssk, p2; repeat from * to end. Row 5: P2, * C4F, p2, k2, yo, ssk, p2; repeat from * to last 6sts, C4F, p2. Row 7: P2, * k2, yo, ssk, p2; repeat from * to end. Row 9: P2, * k2, yo, ssk, p2; repeat from * to end. Row 11: P2, * k2, yo, skk, p2, C4F, p2; repeat from * to last 6 sts, k2, yo, ssk, p2. Row 12: K2, * p2, yo, p2tog, k2; repeat from * to end.